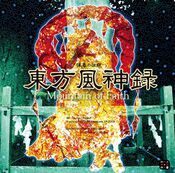 Shizuha Aki (秋 静葉, Aki Shizuha) is the goddess of autumn leaves and thus have to power to control the turning of the leaves. She is Minoriko Aki's older sister and together they have the ability to control autumn. Shizuha first appeared in Mountain of Faith being a stage 1 midboss. 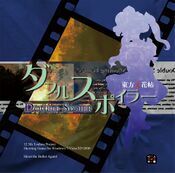 She then later appear as a target in Double Spoiler and in Hopeless Masquerade as a background character. She believes that the autumn colors of the turning leaves are the best thing about autumn, and is filled with a sense of superiority when she shows the beauty of the leaves to her sister. She becomes sorrowful and pessimistic as winter approaches. Surprisingly, she doesn't use supernatural powers to turn the leaves red. Instead she "paints" them by hand, which is why the colors of the leaves are inconsistent. Fallen leaves are another part of her work. Instead of dropping leaves moderately, she simply kicks on the trees and scatters them roughly. She is the goddess of autumn leaves, and with her sister, who is the goddess of harvest, they control autumn. Together they're not the best at fighting, but when someone is disrupting autumn they punish that person. It is difficult for her to gather faith, which makes it a bit challenging to distinguish her from a normal youkai. However, goddesses of autumn leaves appear to be pretty rare, so she doesn't have the problem of competition that her sister Minoriko faces. Her name is Shizuha Aki (秋 静葉). The character for Aki (秋) means "Autumn", and Shizuha (静葉) means "quiet" (静) and "leaves" (葉). 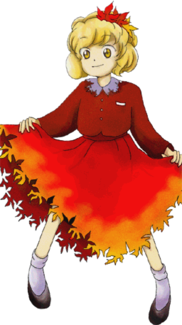 Shizuha has yellow-orange eyes and short blond hair with red autumn leaves in her Mountain of Faith official art. She wears a long red-orange dress with darker red at her middle and arms and more orange towards the bottom and ends with leaf-shaped cut-outs around. There is a white collar at the top of the dress. Under the white collar there is something what resembles a nametag, with three buttons next to it. She has white socks and black shoes. Shizuha was under the impression that the heroine in Mountain of Faith was coming to disrupt autumn, which prompted her to attack. But she was easily defeated, however, being a mere first-stage midboss. In Double Spoiler, Shizuha appeared as a stage 1 target, where she uses a few spell cards and had Aya Shameimaru and Hatate Himekaidou take photos of her and her danmaku. 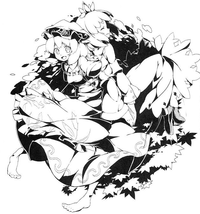 Shizuha made a background cameo appearance in Hopeless Masquerade on the Genbu Ravine and Youkai Tanuki Forest stage. She is seen with her sister Minoriko Aki cheering. Minoriko is her younger sister. Together they control Gensokyo's fall season. Shizuha often brags about how beautiful she makes the leaves look, but is also jealous about Minoriko's popularity with humans as a harvest goddess. It makes very much sense for Shizuha to be the older sister who is the goddess of turning leaves as the leaves change in autumn before the harvest. The older sister of the stage 1 boss, Minoriko. Normally they control autumn together as sisters. They're not terribly good at fighting, but they thought they'd come to warn and punish the humans who came to disrupt the autumn. She believes that the autumn colors of the turning leaves are the best thing about autumn, and is filled with a sense of superiority when she can show her younger sister their beauty. When winter comes, she becomes sorrowful. ↑ Double Spoiler: Spell Card 1 - 3. This page was last edited on 25 August 2017, at 05:54.